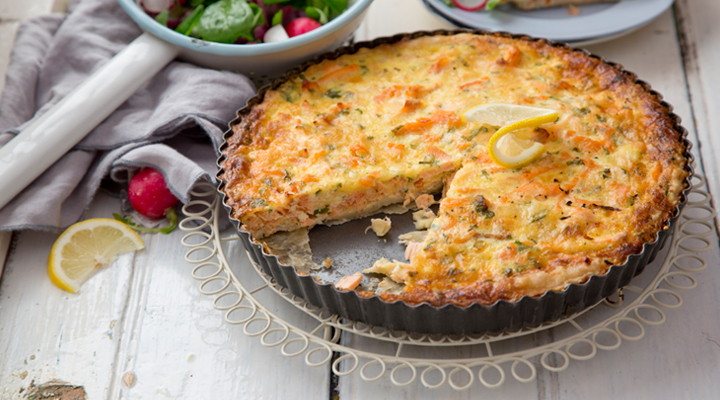 This simple salmon quiche recipe, helps you rustle up an appetising light meal. 2. Unroll the pastry and use to line the base and sides of a 23cm pie dish. Trim the edges and prick the bottom all over with a fork. Line the base with tin foil and bake blind for 6 minutes. Remove the foil and bake for a further 5 minutes to let it crisp up, then set aside to cool on a wire rack. 3. Chop the cooked salmon, smoked salmon and Cheddar cheese into similar-sized pieces. 4. Whisk the eggs and cream together along with the parsley and a pinch of salt and pepper. Add the salmon and cheese and stir until well combined. 5. Pour the quiche filling into the pastry case and bake in the oven for 20 to 25 minutes, until the filling is cooked through and set. Remove from the oven and leave to stand for 2 or 3 minutes before cutting into wedges to serve with some green salad alongside.